Nirmalya is an organization working towards making the life of disabled persons useful and enjoyable. We are a non-profit organization concerned with the welfare of the physically disabled. Our primary purpose is to generate employment for the physically challenged. Started in 2006, this unit promotes the recycling and reuse of material and the usage of eco-friendly items. We reuse newspaper and cloth by making bags, mats, baskets, key chains and other items to generate employment and create awareness of environmental issues. The primary aim in our education program is ‘educating’ the abled and disabled about each other. Formal education in institutions is available for the disabled, but unfortunately many people do not avail of this opportunity. Even in big cities, parents shy away from the hassle and bureaucratic hurdles of educating their disabled children. Educating the disabled, the parents of the disabled, and society to make education easily accessible is a task Nirmalya has taken upon itself. We have watched many paraplegics. It wrenches one’s heart to see intelligent human beings moving around with so less dignity. Because many of them are unaware or unable to change. Dignity will encourage them to stand up and prove themselves. Do you know of a job opening that a physically challenged person could do? No matter what line of work we choose, integration of the physically challenged into the mainstream is absolutely essential – because we live in the same world! We need to change paths, create awareness and give every disabled person a chance to become a productive member of society. 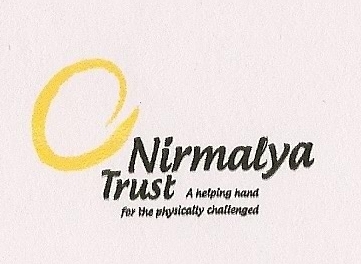 This will be accomplished by coordinated efforts of the Nirmalya trust through programs to: ¥	Provide information and opportunities for health promotion, recreation, employment, sports, counseling services for disabled individuals as well as care givers Cooperate with and seek the support of other groups and individuals that share Nirmalya’s objectives. Establish centers to undertake vocational training and create on-the-job training opportunities. Donations made to Nirmalya Trust are exempt from tax under Section 80G. We also have an FCRA account for foreign donations. Sign up as a volunteer and help Nirmalya with its multiple activities and projects. Eco-friendly items made at Taruvar are of excellent quality and make for great gifts! All our units are in constant requirement of raw material. Write to us to know what we need on a regular basis. Every amount counts! Nirmalya accepts donations in all currencies, in cash, cheque or via online transfers. We will provide you with a valid receipt for every single donation. | Trust registration no: E4228 Pune | PAN no: AAATN6986G | 80G Exemption vide order no: PN/CIT-II/Tech/80G/2011-12/3178 | Date: 27-09-2011. Valid from 1-04-2011 till it is withdrawn. MAK Media and Creations, Pune is honored to be a part of this calendar. Designing a calendar to showcase the talent of the challenged is our humble contribution to their cause. We salute the selfless efforts of Nirmalya – and the creativity of the ‘artists’. It is not surprising that she (Mrs. Meena Bedarkar) has taken on a project like Nirmalya – so creative, so unique, so humane and so relevant for the people it is meant for. What’s more, it is going to train the participants to be industrious, hardworking and learn a means of livelihood and therefore have dignity of life. I have no doubts that her optimism and ‘never say die’ spirit will see her through the mission she has chosen. It is wonderful to see the fruits of Meena’s hard work. Her dedication to the students is amazing. Nirmalya is trying to fulfill a definite need in the society and I am sure it will succeed.